For other uses, see Golden hour. The color temperature of daylight varies with the time of day. It tends to be around 2,000 K shortly after sunrise or before sunset, around 3,500 K during "golden hour", and around 5,500 K during midday. 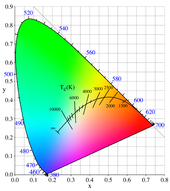 The color temperature can also change significantly with altitude, latitude, and weather conditions). The term hour is used figuratively; the effect has no clearly defined duration and varies according to season and latitude. The character of the lighting is determined by the sun's altitude, and the time for the Sun to move from the horizon to a specified altitude depends on a location's latitude and the time of year (Bermingham 2003, 214). In Los Angeles, California, at an hour after sunrise or an hour before sunset, the sun has an altitude of about 10–12°. For a location closer to the Equator, the same altitude is reached in less than an hour, and for a location farther from the equator, the altitude is reached in more than one hour. For a location sufficiently far from the equator, the Sun may not reach an altitude of 10°, and the golden hour lasts for the entire day in certain seasons. In the middle of the day, the bright overhead Sun can create strong highlights and dark shadows. The degree to which overexposure can occur varies because different types of film and digital cameras have different dynamic ranges. This harsh lighting problem is particularly important in portrait photography, where a fill flash is often necessary to balance lighting across the subject's face or body, filling in strong shadows that are usually considered undesirable. ^ Pincus, Edward; Ascher, Steven (2012). The Filmmaker’s Handbook: A Comprehensive Guide for the Digital Age. New York: Plume. p. 517. ^ Solar altitude in Los Angeles, CA, at 1 hour after sunrise computed for 21 March, 21 June, 21 September, and 21 December 2009 using the U.S. Naval Observatory Data Services Altitude and Azimuth of the sun or Moon During One Day on 30 July 2009. Values obtained were 11.7°, 10.5°, 11.7°, and 9.75°. ^ "35 Best Sunset Photography Tips and Ideas - PhotographyAxis". PhotographyAxis. 2018-08-02. Retrieved 2018-08-11. 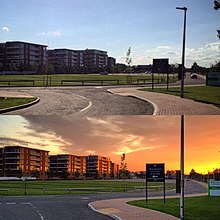 Wikimedia Commons has media related to Golden hour (photography).